Eagerly awaited after the last three inspiring gardens the forth in the new series of Love your Garden was on last night. This week the team visited Wendy and Graham, who had been struck by a number of terrible tragedies over the past few years. Wendy, a teacher at a school for disabled children, had to give up her job after being in a car accident which left her with disabilities. Then two years ago the couple were devastated by the death of their son Matt, who was killed by a drunk hit and run driver. With the support of friends, family and their 3 sons, Wendy and Graham now help to raise funds for SCARD (Support and Care After Road Death) – a charity which offers support to families that have been caught up in such tragedies. Wendy and Graham had been nominated by friends as their garden had been neglected since their sons death and it was hoped that making the garden nice again would give them a new start and something to look forward to, instead of dreading having to cut the grass which was too much effort. The other incentive was that one of their sons Dan and his wife are planning to have a wedding blessing and party in the garden in August. It would be a wonderful surprise for everyone if the garden looked fantastic for this very special occasion and a lovely way for them all to remember Matt. 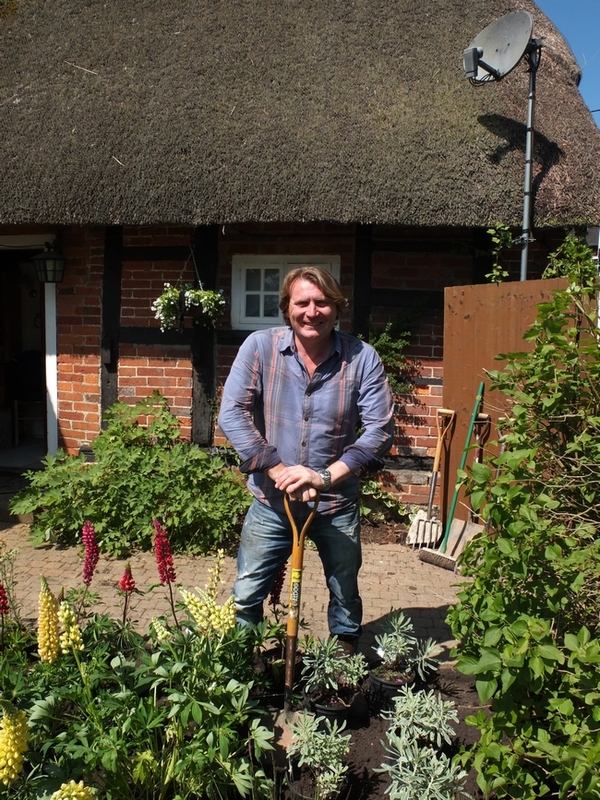 At this point for added inspiration Alan visited a beautiful garden at Dipley Mill near Hook. Details of the water mill can be found in the Doomsday Book which was commissioned by William the Conqueror in December 1085. It contained details of some 13,400 villages, towns and homes in England and its purpose was to record land ownership and its value so William could set his taxes in order to prepare for war with the Danes. The original book is kept at the Public Records Office at Kew in London and was finished in August 1086. Dipley Mill garden was a typical old English country garden, the essence of which would fit well in Wendy and Grahams garden. It had wonderful ponds where the edges were filled with such plants as flag irises, darmera and the stunning gunnera, which always remind me of an overgrown rhubarb plant. Other plants included water lilies, bog plants and oxygenators to keep the water alive. Other features included mown pathways in long grass, seating areas for contemplation and reflection and beautiful Weeping Willow trees near the water’s edge. With all Alan’s ideas for the new garden he went back to see how the team of David Domoney, Katie Rushworth, Frances Tophill and David Dodds, landscape contractors were getting on, clearing the site to start the new garden. Big gardens need big features to make an impact, so with this in mind the first job was to make the existing garden pond four times the size. It was cleared out and a new pond liner laid, making sure that when it was finished the edges of the pond liner were not exposed. The pond had been shelved around the edges to allow for the planting of the pond plants and oxygenating plants according to their water requirements. Water Lilies do not like to be more than 6″ below the surface so their pots were placed on a tower of bricks allowing them to grow and extend their leaf system before the bricks were removed to let the baskets sit on the floor. With all the planting in the pond the water would take up to a week to clear. A Willow Tree was placed near the edge of the pond to draw the eye and give a feature. Willow’s have invasive roots so always plant carefully. Make sure when you create a new pond that it is deep enough in the middle (approx 60cm) so that there is an area deep enough for fish to swim in that will not freeze over in bad weather. With such a big garden, this project required a big team to ensure that all the areas that needed to be improved were worked on in the shortest space of time. Apart from the pond on one side of the garden, a long curved trellis-work fence was erected to pull the garden in and to make it more intimate and with a feel of an amphitheatre. A banked grass seating area was made just the other side of the pond which over looked the new interlocking patio and decked area. A domed gazebo was placed over the top of the patio area and a natural roof was planted around the outside of climbing Jasmine to give shelter from the wind. The favourite expression their son Matt used to use was “If it feels good, do it” – these words were added to the sandstone floor of the patio . The family had been given a number of cherry trees to plant in the garden in remembrance of Matt, these were added too with a number of apple trees, on the shady side of the garden away from the pond. A summer house and potting shed were positioned in the garden to offer an area for contemplation and somewhere to keep the garden tools. The final thing to be completed was the huge flower beds that had been created and now contained over 500 plants. These were full of romantic flowers in ribbons of Wendy’s favourite colours helping to create the English herbaceous borders that Alan had seen at Dipley Mill. There was a wonderful selection of Alliums, Campanulas, Astrantia, Foxgloves, Spirea, Hydrangeas and Dianthus which were planted along the edges so when you brushed past you would be able to smell their sweet scent. The unveiling of the garden to Wendy and Graham came as a staggering surprise as they had not expected the team to tackle the whole garden. With so much to see and take in, they celebrated the new garden with family and friends and hoped that this would give them the inspiration to enjoy their garden and allow them to move on with their lives.